Comments: James Franklin Dorrier began his banking career as a cashier when the Scottsville National Bank, an independent organization, was started in 1901. In 1919, he left banking for 15 years and engaged in the construction business with Lane Brothers Construction Company in Esmont and also on his own in West Virginia, Kentucky, and Ohio. 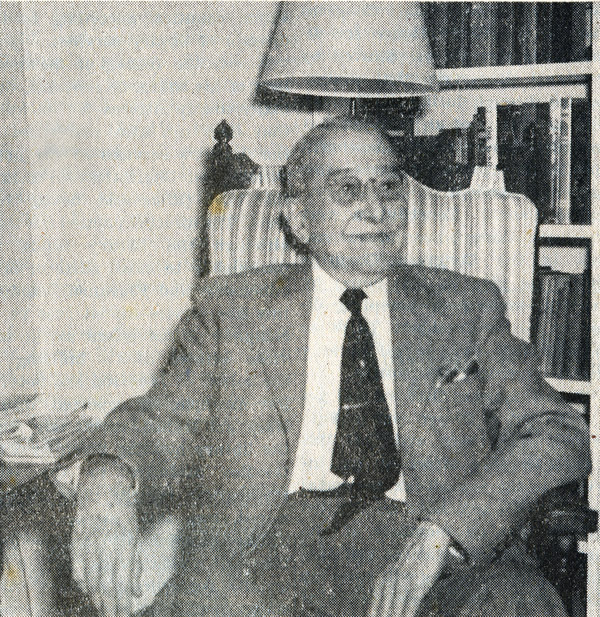 In 1934, the Scottsville National Bank merged with the Charlottesville National Bank and Trust Company, and James Dorrier came back to serve in an executive role with this bank until his retirement on 1 January 1959. In this photo, James is shown on his last day of service with the bank, and he retired as a manager of the Scottsville branch of the Charlottesville National Bank and Trust Company the next day. In recognition of his loyal service to the bank, Henry A. Haden, President of the bank in Charlottesville, presented Mr. Dorrier with a gold watch. Mr. Haden said that Mr. Dorrier had been an extremely "loyal and valued employee of our staff." Upon his retirement, James Dorrier said that much of his time would be devoted to his flower garden. He said his favorite recreation was growing beautiful flowers which gave much enjoyment to his many friends. James Franklin Dorrier was born on October 4, 1882, in Albemarle County, Virginia, and was the son of William Dorrier (1839-1906) and Catherine Ann (Ritchie) Dorrier (1844-1892). His father came to Scottsville from Germany and engaged in farming. For some years until 1928, James Franklin Dorrier lived on his father's farm after buying the interest in it from his three brothers after he left the construction business. When James rejoined the bank in 1934, he sold the Dorrier family farm. On December 8, 1909, James Franklin Dorrier married Sara Henry Carrington at her home in Kirkside, Halifax, VA. There were no descendants of this marriage. James and Sara Dorrier lived in Scottsville the rest of their lives. 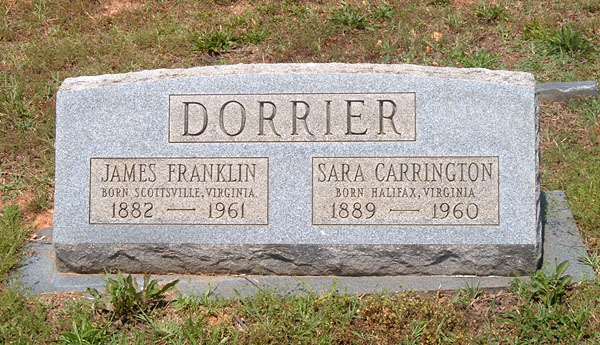 Sara (Carrington) Dorrier passed away on February 29, 1959, in Scottsville, and James Franklin Dorrier passed away on March 30, 1961, in Scottsville. Both James and Sara Dorrier are buried at Scottsville Cemetery. The top photo is part of the Robert Spencer collection at Scottsville Museum. In 2018, Mr. Spencer resided in Scottsville, VA.